Muda : Common mistakes when implementing. Mexican government is no exception. Common mistakes when implementing. Mexican government is no exception. 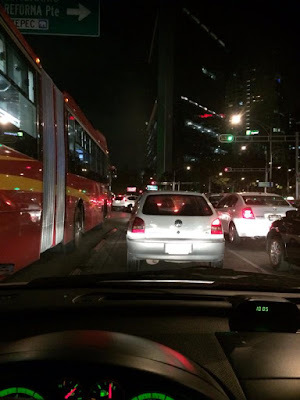 Today I write about the new controversial regulations to control traffic and drivers that Mexico city´s government is trying to implement. I also describe and link this attempt to control traffic and to change driver´s culture in Mexico, to common mistakes done by companies when trying to implement something; a new process, a new tool, a new software, etc. The lessons Mexican government is teaching, I believe, are, invaluable. 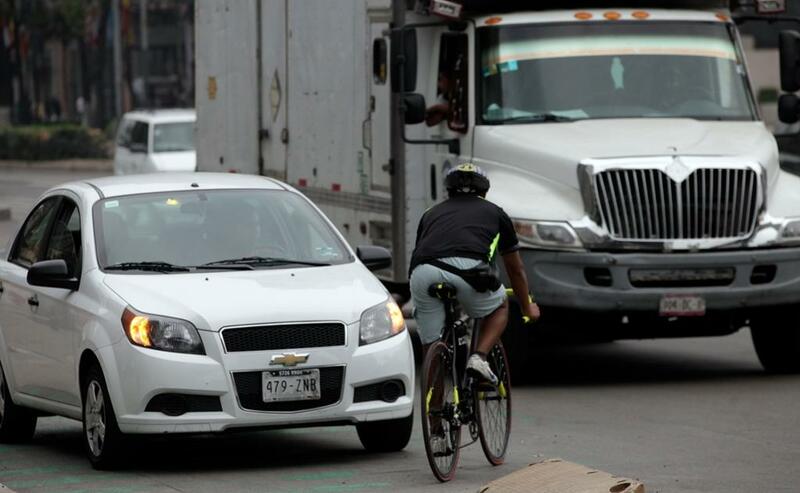 Recently there's been a lot of controversy in Mexico, due to changes done to the traffic regulations. Among the restrictions are that drivers cannot use their cellphones while driving, drivers mustn't invade the crosswalks, the use of the horn, etc. In reality, many of this restrictions have been there forever, but the controversy is on the fines. Some of them have gone insane (from my point of view) considering that Mexico has a deep corruption problem. Some fines are as high as $117.00 Usd. For those reading from the US or Canada or Asia, take those $117.00 and multiply by 17 and will get an idea what a fine feels like in Mexico. The main problem the government is trying to solve, is the way mexicans drive. Drivers here do not respect pedestrians nor cyclists. We don`t even respect other drivers and because of the way Mexico City is planned, it becomes a chaos driving here. Mobility is a problem. So the government thought that hardening fines would help to modify our behaviour as drivers. Some people think that this is only a way to collect money from citizens. But as this isn't a political blog, won´t go there. Instead will analyze briefly what mistakes has committed the government when implementing changes and increasing the fines. Is true that in successful organizations, communication is a top priority. Successful organizations make sure changes are communicated to all members at all levels. To help to understand why the change is needed and how it will be conducted. In our case, the communication from the government has been simple but not yet effective. Since modifications haven´t been explained in detailed and the reason why hardening regulations is ambiguous. The government says it is to avoid accidents and reduce mortality. How ever they haven´t shared any data so we can really see a before - after difference or improvement. These recent days, drivers have been extra cautious and people resist to adopt the new regulations. In great part because they do not understand what the government wants to solve by improving this regulations, but also, because most of the new regulations aren´t clear to us; the citizens, nor the police men who are supposed to apply the fines. As Karen Martin often explains, lack of clarity will often bring resistance to change. One of the most controversial regulations, are the speed regulations. It is supposed to fixed the speed according to the type of avenue. Primary avenues, allow a maximum of 80 kmh, while secondary avenues allow only 50 kmh. Small streets, like those in the neighbourhoods, allow a max. of 35 kmh. The problem is that nobody explains what is a primary avenue or a secondary. ways. Wrong culture in the streets. And unfortunately there aren't enough signs or visual aids in the streets so drivers can see clearly what´s the maximum speed allowed. This is a critical missing tool, since it is very common to drive long distances without a single sign on the maximum speed. Other common place are intersections. There are a lot of intersections without crosswalks, or with no clear identification on the street´s directions. Visual management in industrial environments usually gives feedback to the worker, to see if he/she is falling behind, if there is enough material, if more material is needed, or where scrap or reworks or defects should be placed and when it becomes necessary to take care of them. I have always thought that streets should clearly give feedback to people. Providing information about speed, places where it is correct to cross, walk or drive. When and where is necessary to stop and promote flow of people. Other major problem are green and/or red lights, since the city doesn´t have a synchronised network to allow flow. Is really common that in the same avenue, one light is red, and one block before is green. This is basic to protect pedestrians, cyclists and drivers. And also necessary to promote mobility (flow). With a chaotic environment like the one I described before, is clear that streets and avenues need better planning. If we sum the lack of standardisation and visual management, plus the wrong practices and poor culture when driving, we have as a result a city where is really a nightmare driving. That´s why have streets that do not allow law breakage is fundamental. 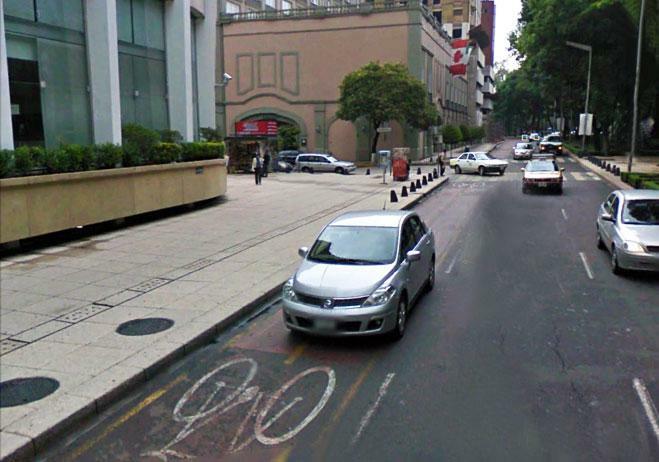 Consider the factors iIhave described before and will clearly see why it doesn´t just work having lines painted on the floor and call it bikeway (see below´s picture). To really protect citizens, a little bit more infrastructure is required; poka yokes that do not allow cars to trespass the limits. Probably in Norway couple of lines painted on the floor work, but definetely do not work here in México. Finally, this example gives the government the opportunity to go out to the streets and see for themselves if the new regulations are actually protecting people from having accidents while promoting flow. Also the opportunity to learn and adapt rules and laws according to the reality, that we, as citizens, are facing. Of course, as many failed implementations, leaders do not take the opportunity to go to the source and validate their proposals. I have seen many leaders (including myself) thinking that proposals, or ideas, or rules implemented would work perfectly on the real world, when in reality they are not. This is in a way, arrogance, because we, sometimes think that our solutions work perfectly and there´s no need to improve or adapt any aspect of our proposal. Lean is powerful, because allow humility inherent in seeing, learning and experimenting to determined if our solution is the best. Hopefully our government would take a step out of the office and see for themselves. Most important, hopefully, by watching and learning, would take appropriate countermeasures to allow moving in this city would be more pleasent and safe. Thanks for reading, I would love to read your thoughts. Please leave a comment below.